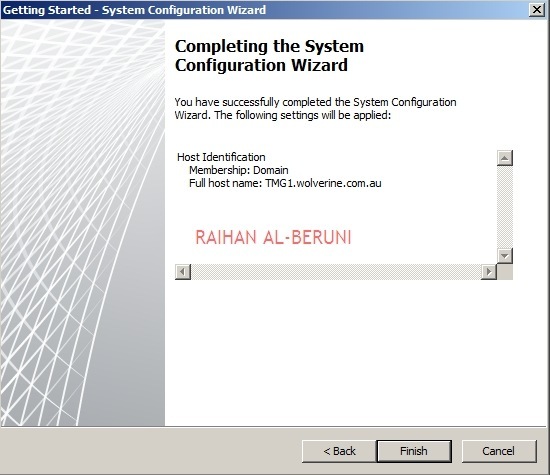 This is Khaja, i am new to windows administration and i want to install TMG2010 i don’t know about TMG can you tell me why we use TMG and what the basic configurations and installations i need to do in my machine. Plese reply me back. TMG can be used as a proxy, proxy cache, reverse proxy, firewall, gateway, content filter, VPN, web publishing so on and so forth. Hi, lovely document I have has a read through as I am tryijng to configure TMG server as a back firewall but behind an ASA, do you have any documentation or guides on how to do this that I could read? I have a regular Time Warner gateway. so is it route 10.7.7.0 mask 255.255.255.0 10.1.1.254 ???? and if so, shouldn’t I be able to ping the external gateway from the internal network? I want to have all these settings correct before I install. No not at all. TMG block everything by default. 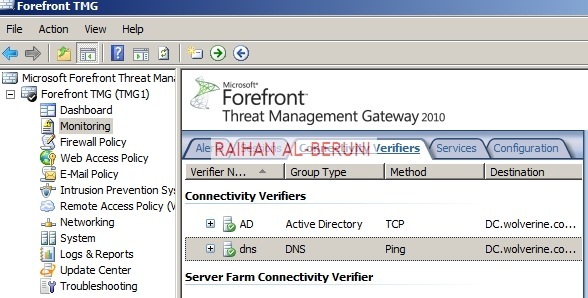 you need to open/allow in firewall policy to ping external gateway. Probably, you are trying to configure edge firewall and configured backend firewall. 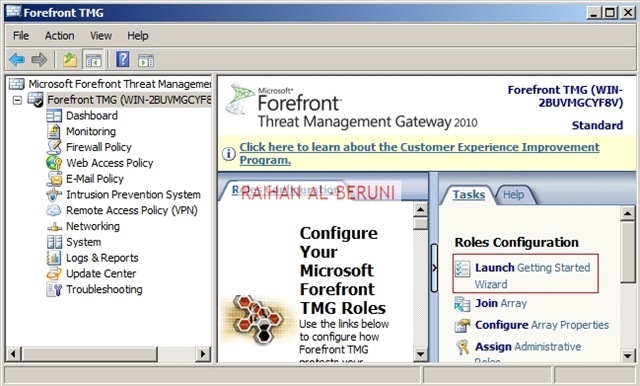 Is your gateway acting as a front end firewall then TMG can act as backend firewall otherwise your description shows that you need to configure edge firewall. 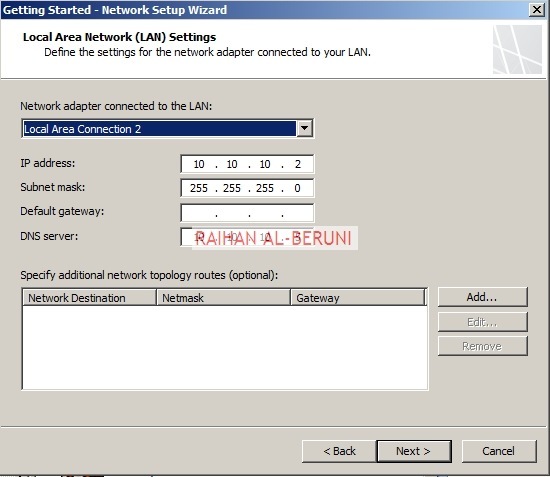 Please explain a bit more if I didnt understand your network design. Actually – I guess what I really am seeking is the correct route add -p command. What I am not sure of, is do I complete that with the Back End Firewall External address — 10.1.1.254 or do I select the Front Firewall of 10.1.1.1 address. Once you install TMG and select a topology. 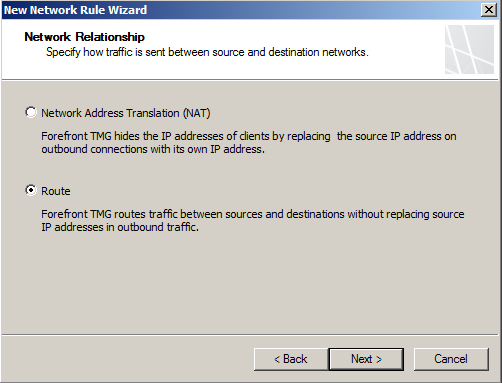 routing will be automatically selected by TMG unless you have special routing need. You did not need answer my question, to help you and provide correct answer…….. 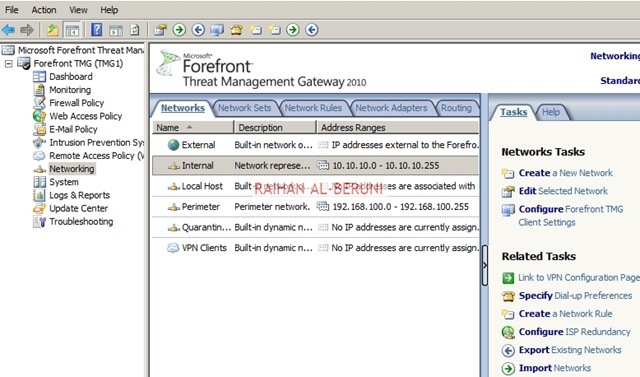 Your router is working as Front end firewall or not? 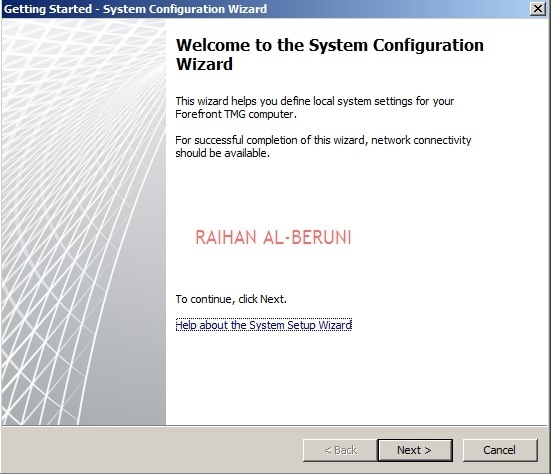 If yes then you need to add routing table in backend server otherwise you donot need to use route add command. We have a checkpoint on front and isa 2006 on back, we are trying to upgrade to TMG. 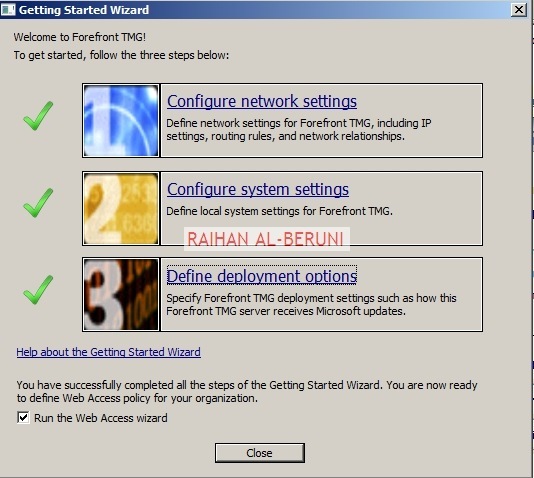 First you follow this http://microsoftguru.com.au/2010/03/08/forefront-tmg-2010-how-to-install-and-configure-forefront-tmg-2010-step-by-step/ in your test environment to learn correct installation than you try back to back firewall. I am going to be using this setup at home using virtual machines. I want this type of DMZ with a front end TMG and a backend TMG. Does this setup assume you have a Cisco router and not a “Linksys WRT 160N” (like I have at home)? Would I have to find a device where I could turn off Nat? TMG does not see what type (manufacturer) of device place in front. you can configure NAT separately or turn off or create custom rules. I want to use this type of setup since I am in IT and want to set it up at home and use it for years, so it becomes second nature to me and if any future companies I work for needs a back to back TMG, I’ll already know how to set it up and administer it. You know what. I just thought about this. Couldn’t I just remove the “Linksys WRT 160N” and connect directly to the modem? I am not clear about this question. please explain a bit. 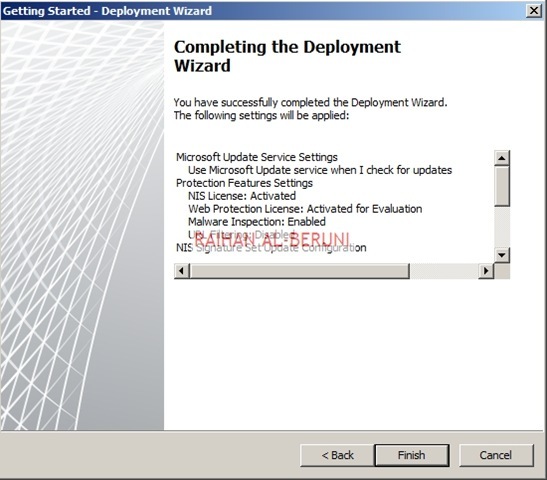 Would you leave the device alone and accept the default setting (which is NAT)? Would you make any adjustments on it before placing a back-to-back firewall (AKA: TMG) behind it? The firewall on this Linksys WRT160N blocks all ports. Period. Would you turn off the Firewall portion “off” and let DHCP (on the Linksys WRT160) hand out static IP’s to the front end TMG and backend TMG? If it was your device, how would you configure it with a back-t0-back TMG firewall solution? 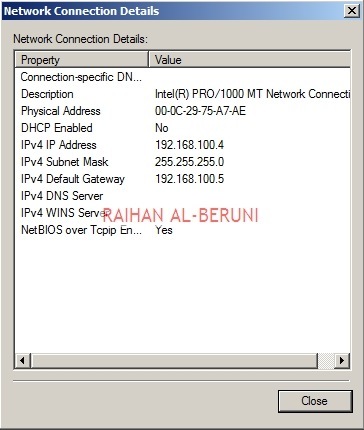 DHCP does not hand out static IP DHCP is dynamic. TMG is an awesome technology. I would utilize TMG as much as I can. So Turn off NAT or firewall on this device and let TMG manage everything. 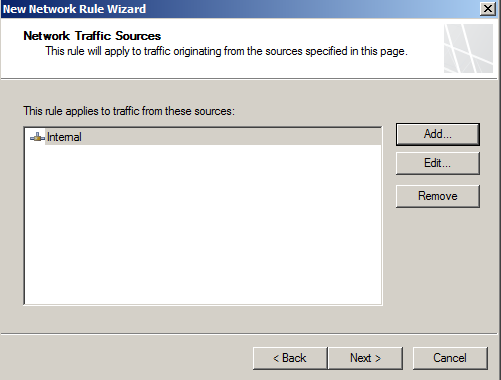 TMG must have static IP in all NIC whether front end or back end. TMG got many features like web proxy, firewall, reverse proxy, proxy cache, content filter, many more. 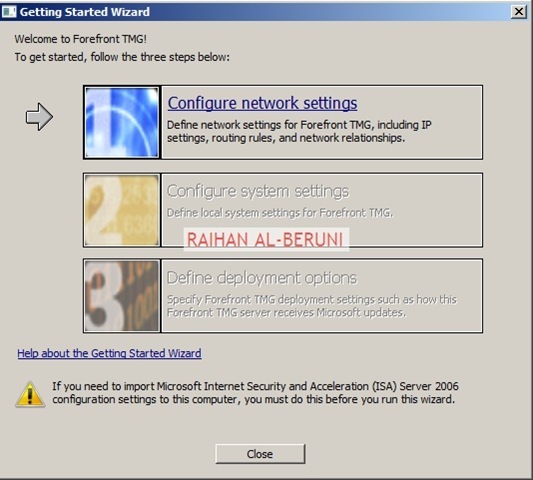 I’ll hand out the static ip addresses (via DHCP) – using the MAC addresses of the two TMG servers. 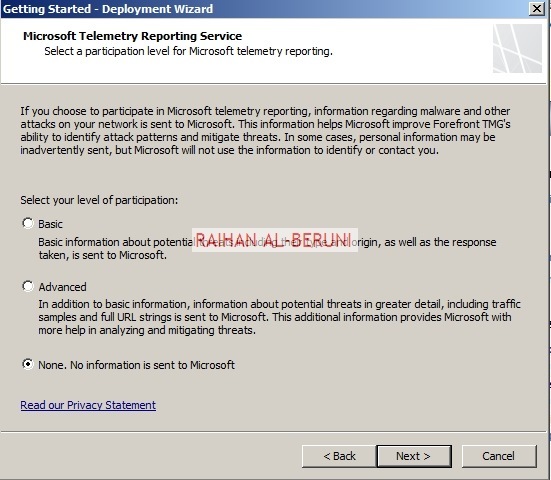 Hi Raihan, very nice articles here. 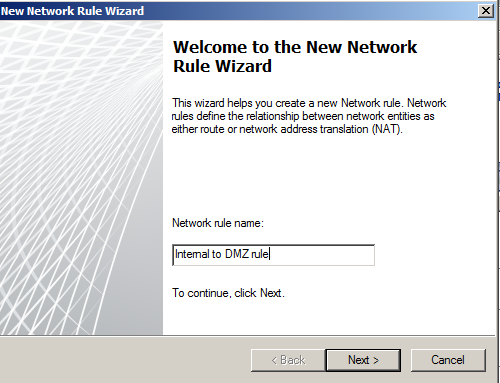 I have to setup a TMG server as a reverse proxy into a DMZ to use it to publish Lync and Exchange sites. 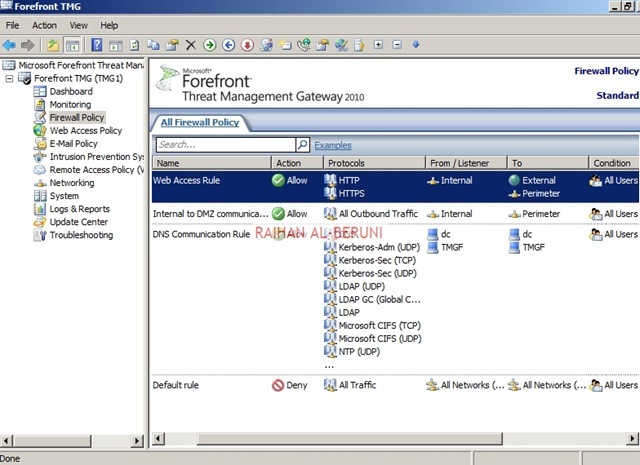 I have a fortigate as front firewall. 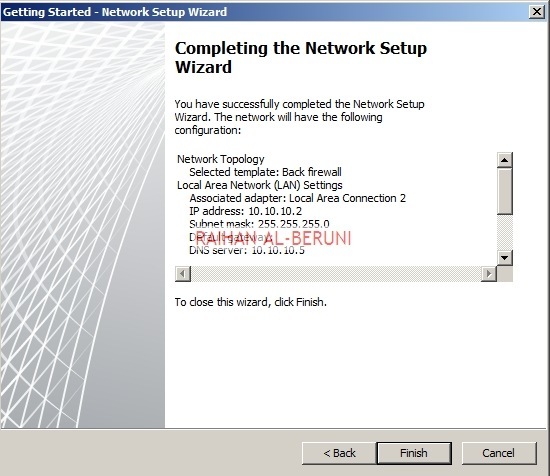 Is the back firewall the best choice for my setup? 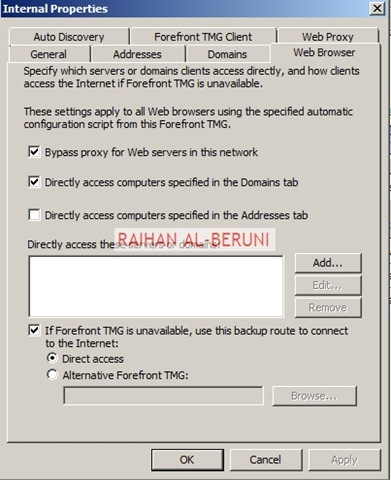 If yes wich rules do I have to create into my TMG back firewall (reverse-proyx)? 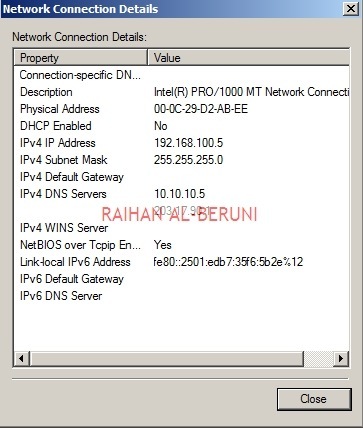 For reverse proxy as name suggest, orgininating traffic will be from external and destination will be internal. Thanks for your reply Raihan. 2. Do I have to make the TMG FE server a member of the Domain? 3. Which segments in the BE TMG I need to move to the FE? 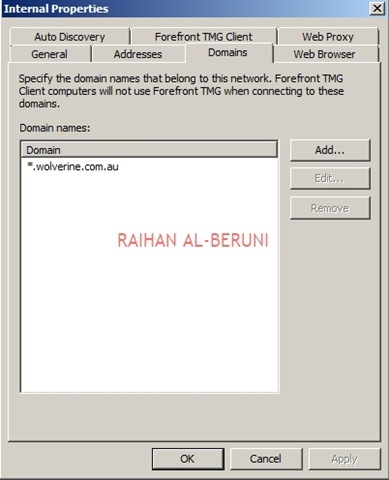 Backend TMG will be member of domain. Frontend in workgroup. your smtp server should be in internal network. 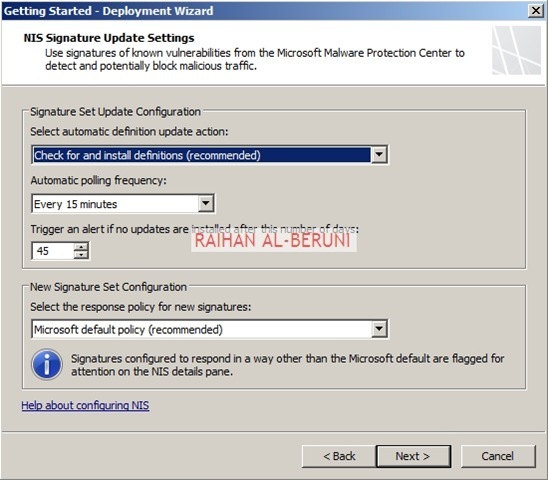 for proper functionality you have transition the systems and firewall at the same. plan ahead and do it. Thanks, yes I will be deploying the TMG servers over a weekend to avoid any downtime and my plans are like you suggested the BE-TMG will be a domain member and FE-TMG will be in a workgroup. Current TMG Server: 3-leg with 4 NICs >>> External, Internal and 2 perimeter networks. The problem or doubt that I have is where to place the current 3-leg TMG, can I make this server the BE-TMG and leave the perimeter networks as they are? Or would I have to remove the perimeter (2 NICs) and place it on the FE-TMG? Hello. Very good arcticle. But I have one question. 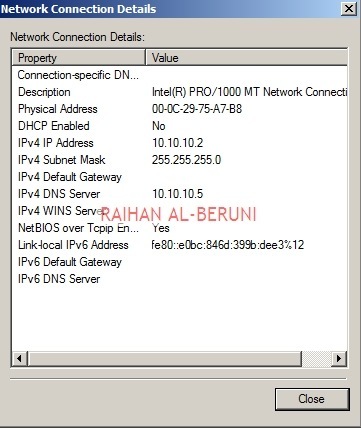 Why perimeter network must have only public ip address range? 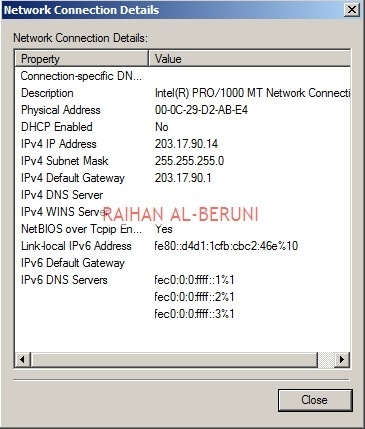 Is it possible to use special private (not the same as internal corporate network) ip range for perimeter network? could you help me with this question? 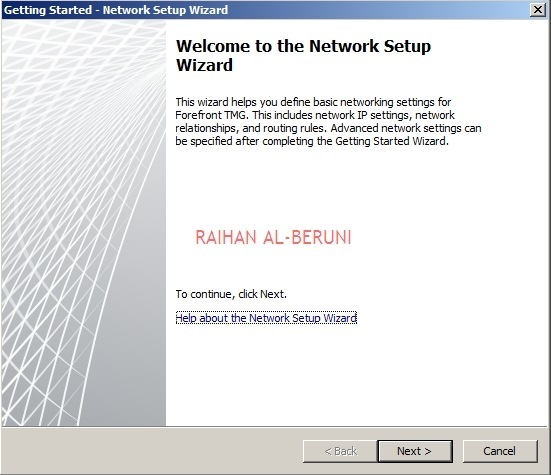 we are using IAS 2006 server for our Local Area Network, for URL filtering and VPN sharing, we used two Lan Adapters in our ISA2006 server, one is for ADSL (internet) and another one is Lan switch.also we have local win 2003 domain controller. 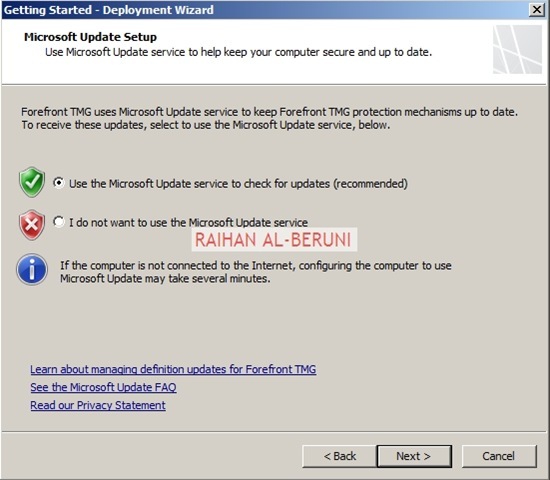 Now we planing to install Forefront TMG 2010 server in our Local network for URL filtering and VPN share, which operating system required for us? and which TMG server is suitable ? 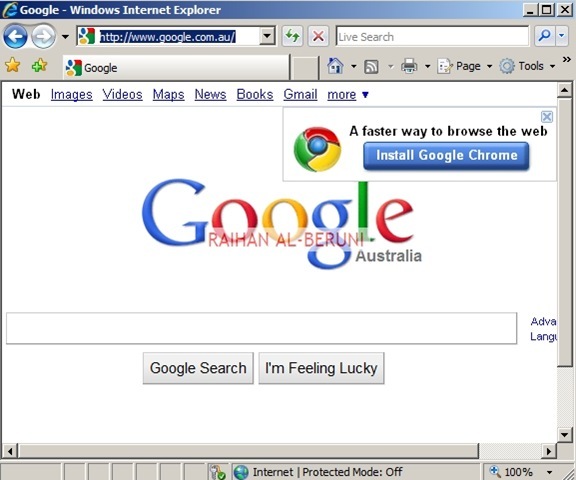 and we need any Domain control for this?. How to install Please guide me as soon as possible.Thanks for your replay. 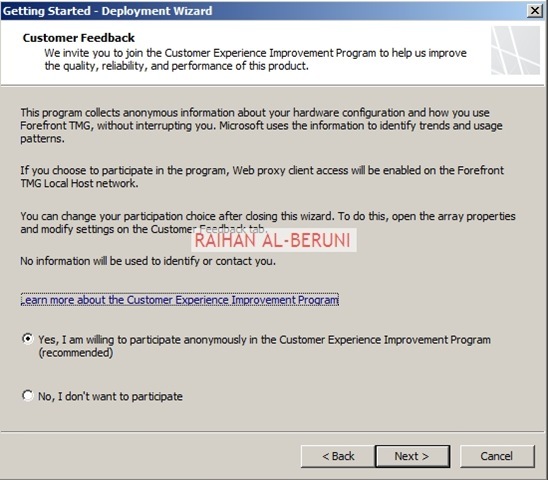 If you have bought enterprise version you can install back to back firewall using two TMG server. 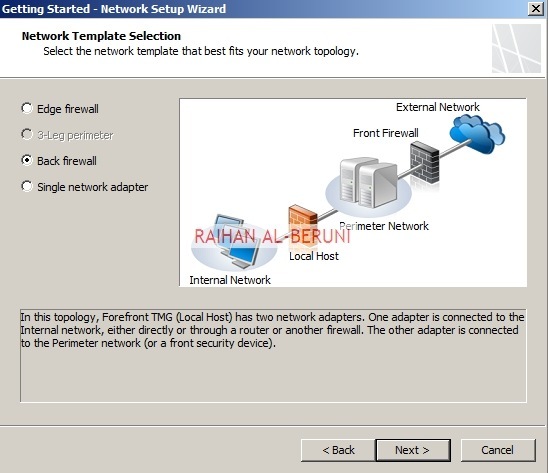 However if you have 1 TMG license than you can use Edge Firewall Topology. 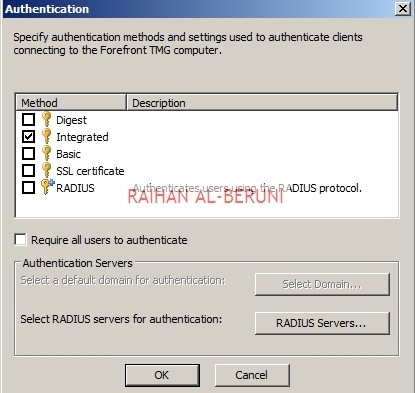 Depending on your topology if internal users wants authentication than yes tmg can be member of domain. what sort of data you cannot retrive? is it logs you are talking. check whether you have configured a logs? 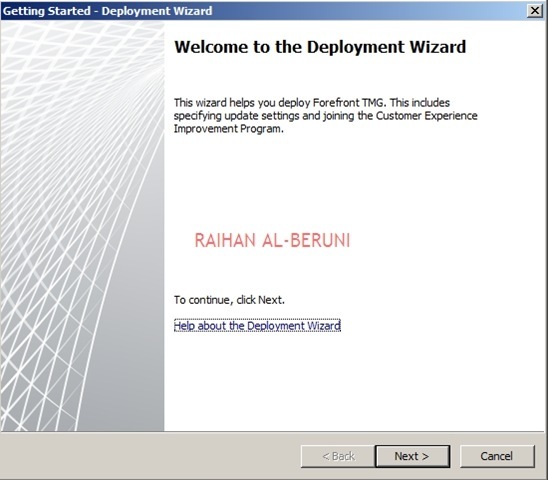 We currently are testing TMG2010 as a back end firewall with another appliance based firewall as the front end. do you have any information around this kind of a configuration? Thanks for the assistance and guidance.